Whether you’re restoring trim that’s dull and faded, or protecting trim before it fades, the BLACKFIRE Total Trim Restoration Kit features four must-have car care products for proper trim care – BLACKFIRE All-In-One All Purpose Cleaner, BLACKFIRE Total Trim & Tire Sealant, 2 Poly Foam Applicators, and 2 Microfiber Detailing Towels! This simple two-step trim restoration and protection system will keep your trim looking its best for as long as you own your vehicle. 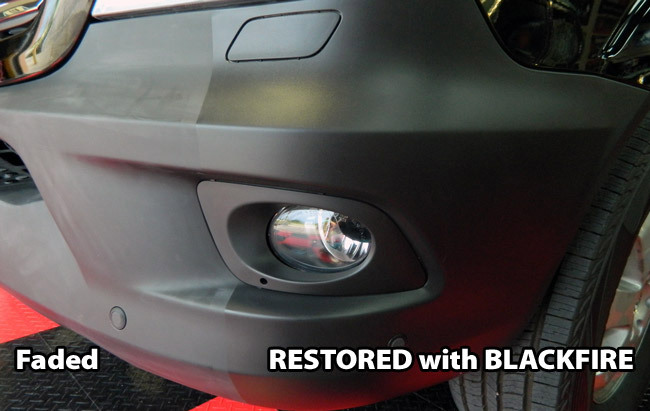 Use the BLACKFIRE Total Trim Restoration Kit on both old and new trim. BLACKFIRE Total Trim & Tire Sealant is the solution to an issue that plagues almost every vehicle manufactured in the last 30 years – dull, faded, and discolored plastic exterior trim. This thick, gel-like formula penetrates deep into the pores of plastic, rubber, and vinyl exterior trim, restoring the finish to factory-new condition. A traditional trim dressing might last a week or two if you’re lucky; BLACKFIRE Total Trim & Tire Sealant provides MONTHS of durable protection. Use it on tires as a long-lasting, waterproof dressing! BLACKFIRE All-In-One All Purpose Cleaner brings new meaning to the word "versatile." Used full-strength, it is an aggressive, grease-cutting cleaner for engine compartments and wheels. When diluted 4:1, it's a gentle cleaner for leather seats and paintwork. Dilute BLACKFIRE All-In-One All Purpose Cleaner to clean virtually anything, safely and effectively. It's the only APC you need! Use these microfiber detailing towels for drying, buffing, or as a finishing wipe down. Microfiber is designed to be light, strong, super-absorbent and quick drying. The fibers are non-abrasive, and are woven so tightly that it’s absolutely lint free and extremely durable. Unbelievably, these ultra-tough fibers are engineered to absorb seven times their weight in moisture. Foam wax applicators can apply any wax evenly without creating any swirl marks. They are absorbent in order to catch drips or runs, and they apply perfect, even coats of paste waxes and polishes. These work perfectly for applying trim dressings and protectants. A total retail value of $65.94. You save $25.95! Clean the surface to be treated with BLACKFIRE All In One All Purpose Cleaner. Ensure surface is completely dry to the touch prior to application of BLACKFIRE Total Trim & Tire Sealant. Apply BLACKFIRE Total Trim & Tire Sealant to desired surface using a foam or microfiber applicator. If applying to tires, use a foam tire applicator. Apply a nickel-sized amount to applicator and spread a thin, even coat over the surface. Immediately buff surface dry with a microfiber towel. If used on tires, allow to dry before driving. Restores, protects, and renews exterior trim of any color. Check out the trim on this Mercedes-Benz Sprinter. The left side is dull and faded; the right side has been restored using BLACKFIRE Total Trim & Tire Sealant. The difference is night and day!